3.6 out of 5 based on 37 bloggers and 17 commenters. This template looks better if you set the posts per page in a multiple of 4. Eg. 8 posts per page. 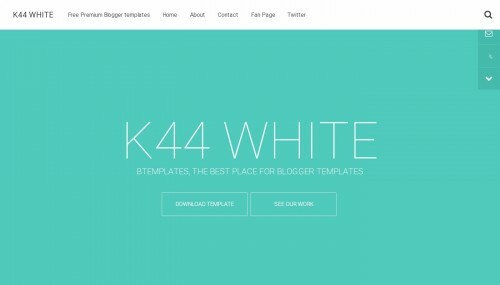 K44 White is a free premium blogger template with 1 column, responsive design, magazine-styled, right sidebar, gallery-styled, fresh look, an exclusive design for Blogger, footer columns, slider, social bookmarking icons, related posts support, well designed threaded comments and 404 error page customized. Excellent template for blogs about any general topic, art, business, entertainment, fashion, to use as a base to create your own design, music, photography or a personal portfolio site. its good to hear about K44 to make a blog. we can make different blog by using template. Thank you for sharing. I liked this theme. Congrags! In “Shopping, Galleria, and Video,” is to put these icons an access link? In order to click on these icons and follow a link? when to go, where to go and how to go on a rafting vacation in Rishikesh. We cater to the needs of both domestic travellers as well as foreign nationals. We specialise in tours to Haridwar, River Rafting in Rishikesh, Chardham Himachal Pradesh, Rajasthan, Agar . It is amazing template thanks for sharing. Sensacional esse modelo. Baixei e adorei. Obrigada. hey anyone can tell me? i haven the blog site but i want to chenge the template to wordpress its is useful or not? Thanks for the post and keep sharing stuff like this i really appreciate your work. It’s wonderful template. It’s very helpful for people. Thank you for sharing this. Thanks for sharing an excellent and informational blog.It’s an amazing template as well as it’s useful and helpful for all those people who want to create an creative blog. Thanks for uploading such helpful blog. Just a quick note, I was not able to use this template until I removed the “CustomSearch1” widget coding in Dreamweaver. When I went to upload the original, unedited file, I got a “could not parse” style error, stating the issue was the CustomSearch1 widget.